Emakina Group announces its annual results for 2016 today. Last year, Emakina group again recorded double-digit revenue growth and maintained its net result. Thanks to this, the group has been able to strengthen its equity base. The group registers continuing double-digit growth in activities, with revenues of € 77,339,000, up 10%; and an EBITDA of € 5,400,000, down 11%. More detailed data are available in the news section of Emakina Group’s finance page. In 2016, new national and international clients partnered with some of Emakina Group’s agencies. To name a few, these included: Agrifirm – Nuscience, Aquafin, Aspern Smart City, Assemblin, Balta Group, Bridon Bekaert Ropes, Carglass, Carrera, Citroën, Coolinvestments, De Persgroep, Diageo, Gaastra, Groupe Holder, Héléna Rubinstein, HEMA, Högl Shoe Group, Jacob Holm, Kodak Alaris, Konica Minolta, Ladurée, Legolas, Liérac, Louvre Hôtels, Marktplaats (Ebay), Maserati, Mondi, Mr. Green, Naspers, Ores, Parrot, Paula’s Choice, Phyto, Puratos, REWE Group, Santander Bank, Sigfox, Stanley and Stella, Ter Beke and Wolford. In January 2016, Emakina acquired a 100% stake in the Swedish digital agency Dempsey, based in Stockholm, with a staff of 15. Through this transaction, following on from the commercial partnership agreement signed in 2013, Emakina reinforces its presence in the Scandinavian countries. In September 2016, Emakina acquired a 100% stake in k.section, a CRM expert agency, based in Vienna. k.section is a certified partner of the world’s leading CRM solutions, including Siebel/Oracle, Microsoft Dynamics, and Salesforce. The k.section team comprises around twelve experts. In January 2017, Emakina acquired all the capital in the Swedish company Doe Blomberg Gottberg (DBG), three times winner of the Swedish ‘Communication Agency of the Year’ award. By acquiring this second agency based in Stockholm, Emakina has reinforced its presence in Scandinavia, where it now has over 30 staff, as well as its position as European leader as an independent full-service agency. In geographical terms, the share of the revenues recorded ‘outside Belgium’ accounted for 59% of the consolidated revenue in 2016, compared with 57% in 2015. The group’s significant expansion over the past few months calls for a considerable effort as regards integration and synergies among the various entities in the group. In practical terms, this is reflected in the deployment of joint management platforms and in better sharing of respective know-how, available resources and technologies. These efforts inevitably weigh on the group’s operational profitability. Talent is both the main asset and the challenge facing Emakina Group, which does everything possible to attract and develop exceptional people. 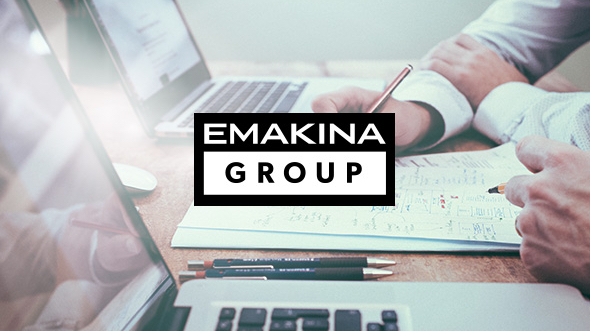 At Emakina Group, talent is given the opportunity to develop: through contact with colleagues and demanding clients; by receiving training; by participating in research and development programmes. In 2016, in order to strengthen its technological competence, Emakina concluded new technological partnerships with IBM, Progress Sitefinity CRM, Marketo Marketing automation software and Kentico, for which Emakina has become the first certified technological partner for Europe. In 2016, Emakina won 70 awards for various projects involving web-building, motion, design and creativity, emphasising the quality of the services we provide. Demandware (now known as Salesforce Commerce Cloud): ‘EMEA Sales Partner of the Year’ and ‘EMEA Runner-up Implementation Partner of the Year’. Selligent: ‘Campaign of the Year and Best Creative Awards’. Sitecore: ‘Best Digital Marketing and Best Business Awards’. Congratulations to all on this fine performance!